This is appropriate, don't you think? There are certain things that I try to ensure I always have in the house. Pork Tenderloin is one of those items. They are so easy to store, freeze, thaw and prepare. One recent Saturday afternoon, I pulled two out and let them thaw some. Then I reached into the cupboard and pulled out another staple...a marinade. Yes, I enjoy making my own, but there are some that just work for me and I so enjoy them. One, that I can not get here in Memphis is Uncle Ralph's Barbecue Sauce, though you can get it on the internet and I will be putting in an order soon. Uncle Ralph's is a Rochester company that has been around since 1996. They are not as well known as the other upstate NY Barbecue newcomer, Dinosaur Sauce, originally out of Syracuse and now also in Rochester and New york City, their restaurant spurred on a retail business. I know there are thousands of regional barbecue sauces that everyone will claim are the best and that is most certainly true. I also bet 80% of them are basically the same sauce with one different ingredient - IF THAT! But back to that recent Saturday, in the cupboard was another old favorite of mine, Stubbs. I put the Stubbs in a big old freezer bag and then tossed in the two tenderloins. I let them marinade for about 3 hours and then pulled them out and lightly wiped them off. I wanted to keep the spices that was in the Stubbs on the surface. I saved the marinade to use as a baste. Meanwhile I had two pounds of red potatoes and I quartered them. I put them in a bowl and added a couple of tablespoons of olive oil, some sea salt and fresh ground pepper and some fresh rosemary from Nancy's herb garden. I mixed it all together and then put it into one of those Reynolds Grilling Bags and sealed it according to the directions and placed it on the back burner of a pre-heated grill. Turn the bag occasionally while cooking the tenderloin. The potatoes should take about 30-45 minutes. I also like them a bit crispy. While the potatoes began to grill, I took 8 slices of Prosciutto and laid them out flat. I then covered them with some freshly grated Parmesan-Reggiano Cheese - the King of Cheeses IMHO - and then laid 4 spears of pre-trimmed Asparagus in the center of each slice of Prosciutto and then wrapped the Prosciutto around the spears. I then places them on a cookie sheet covered in aluminum foil. I put the tenderloins on the grill and cook them until done. I prefer them to just have lost all pink, but y'all prepare to taste. Use the marinade to baste the pork as it cooks. Once the tenderloins are off the grill, I loosely cover them with some foil and let them rest for about 15 minutes. I take the remainder of the marinade and warm it on the stove top. For that 15 minutes, the Prosciutto-wrapped Asparagus goes into a 450 degree oven or until the Asparagus is done. Don't burn them! Slice the tenderloin - again I like to cut thicker pieces myself - put some on the plate cover them with some of the marinade and serve with the Prosciutto=wrapped Asparagus and red potatoes. YUM--fresh local asparagus is only a couple of weeks away! Have you tried grilling the asparagus bundles? TURNBABY: Actually, yes they can also be grilled. SONGBIRD; But now you have a plan for dinner! Must show this post to Ralph, my personal chef. Actually pork tenderloin is fairly economical for two people - they are often "buy one get one free" - we cook one and freeze the other. And have plenty of leftovers. We have a rosemary plant in the house and Ralph used some sprigs Saturday to fry up chunks of rosemary potatoes. That sounds delicious! And it didn't require onions or peas. I think I might use it again with some asparagus! Now this really looks good. I'm not much of a cook, but if I keep reading this blog I'm going to have to start. And another Beatles song too. PATTI: This would be a snap for your personal chef...get that grill fired up! JOHN: This is a real simple meal..YUP! Funny how the Beatles have songs that I relate to food! In the cold months (of which there are about 8) he cooks the pork tenderloin on top of the stove, then finishes it in the oven. YUMM-O I am a foodie too..ain't it grand. Great meal..I'm going to do this! LEELEE: WOOO welcome! Glad you enjoyed the visit and try the meal. mmm I just made pork tenderloin tonight actually but I stuffed it and roasted it in the oven instead. Yours looks awesome though!! Thanks for leaving a comment on my blog :) You've now given me a new one to follow! 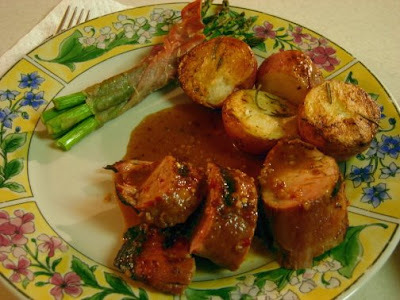 I've got these Prociutto Wrapped Asparagus in the oven RIGHT NOW!! YUMMY! !